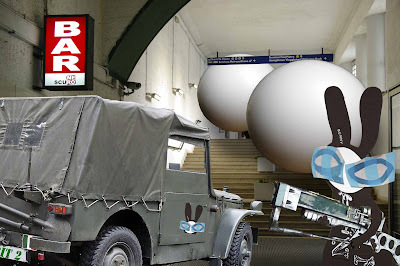 The Wabbit and Fuoristrada raced round the Gianicolo Hill and down towards to San Pietro Station with the balloons bouncing behind them at an ever increasing rate. Nothing seemed to stop them. They bounced over anything in their path and as they bounced they howled and droned. Occasionally without warning they span round and round, setting up a gale that tore at trees and rattled windows. But the Wabbit had gained some ground and Fuoristrada bumped down the steps of an underpass, then emerged at the other side and tore through an underground car park. "Double back!" shouted the Wabbit and he rummaged for something in the back of the vehicle. Fuoristrada darted down Via del Crocifisso and into Piazzale Gregorio VII. Suddenly they were staring at the balloons coming towards them down the stairs of the station and the Wabbit jumped out with the gun he had made in the shed at the back of the Department. "Stand and deliver!" he yelled at the balloons and he fired at the roof and plaster scattered all around them. The balloons shuddered to a halt and even though they had no eyes, they seemed to look at each other with horror. "Fuoristrada!" said the Wabbit authoritatively, "I'll have a carrot aperitivo spritz." How would you like it?" asked Fuoristrada. "Gently stirred," said the Wabbit.